Summer is over and my children have a few new scars. Our Lab loves to swim with my kids and their friends. She gets too excited in the pool with other children who are being active. I do not want her to hurt a child. She mostly uses her front paws to try to put them on the kids shoulders or at least that is what it looks like. I really do not understand but I need some advice on how to teach her to swim nicely when the kids are in the pool. Can you help me with some ideas that I can work on between now and next summer when there will be friends here again alot? I can get in the pool with India and work with her but I don't know what to do. India sounds like a very enthusiastic Lab. In her passion to either play with or protect your children, it sounds like she is unable to exercise self control. This is not an unusual behavior for dogs, especially breeds bred to swim or protect. Labs and Golden Retrievers have boundless energy and enthusiasm that is amplified by children, play and their favorite activities like taking walks or in India’s case, swimming with her pack. Since it may be some time before your children go back in the water you have plenty of time to help India learn self restraint and be a gentler playmate for your children and their friends. There are several causes of excited behavior in and around pools. The first step in finding a solution is to identify the reason that India plays roughly. Some dogs have a fear of water and attempt to keep their pack mates safe by barking, whining or herding family members away from the water. Certain herding breeds may nip at ankles to deter children and adults from going into the water. Some dogs stand at the side of the pool and bark until the people come out of the water. Of course this is a successful maneuver because the people do eventually come out. Unfortunately, the dog believes coming out of the water is a result of his efforts to call the people out by barking. The behavior is reinforced each time someone gets out of the pool. Other dogs enjoy the water and become over stimulated to the point that playful behavior becomes painful for the humans that are in the water. Depending on the age of your children and the type of play taking place, India may become more and more excited. Laughter and screaming may result in a highly energized and excited state for India. Rough play may indicate that your children are in danger and India may jump on them to get their attention and stop the “dangerous” situation in the water. The solution to India’s behavior in the pool depends on her reasons for jumping on the children. Begin by practicing exercises that help you get India to focus on you when she becomes excited. Basic obedience exercises such as sit/stay; come when called and walking at heel are a good starting point. To begin, practice these skills in a quiet environment that has few distractions. As India learns these skills, gradually add distractions. For example, once you can execute a sit/stay position for a minute or more in a quiet environment you can ask one of your children to run past India with a toy or a ball. A successful completion of this exercise ends with India in the stay position. India has learned that she needs to focus on you and that you are in charge. Once she understands that you are the leader, you can increase the distraction level until she is able to sit peacefully at the poolside while the children play in the pool. Join me next week when I will offer you more tips on how to help India become a safe swimming companion, with a bit of practice and diligence on your part. Good luck! 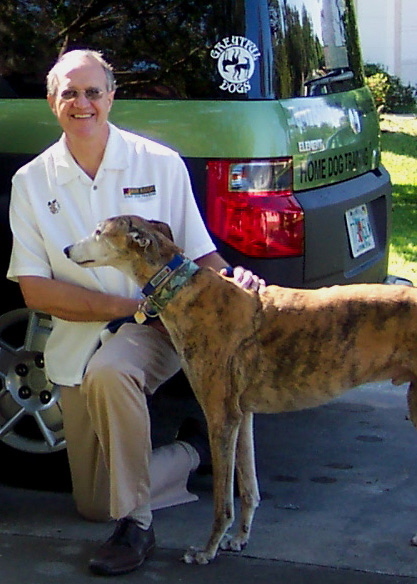 For more information on Mike Shamp and his training, you may find him at Bark Busters of Central Florida. you can also visit Bark Busters' Training Tips Page for help. Teaching Maya self-control has been, and still is, a long and gradual process. Like described above, I start out with easy stuff with no distractions, then gradually add distractions. I'd work with India every chance you can get. It might just take until next Summer to get her to be calmer in the water.